Ask the average person if they want to roam around a room that once was filled with dead bodies or run their hands across coffins in the cemeteries and I imagine their answer would be "no". 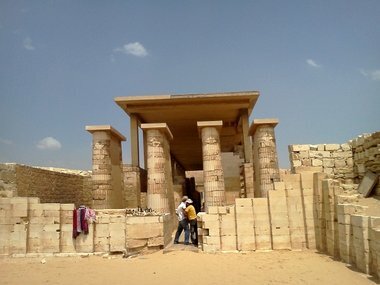 Of course we don't see Saqqara (also spelled Sakkara) to be as foul as we do modern death. The bodies are gone, the stench of death far removed, and all that remains are the ruins of a time in mankind's history we have difficulty relating to. Remember that as your precious little Nike trainers trample over the final resting place of some mankind's earliest modern ancestors. Of course I'm not normal, and I admit I enjoy imagining flesh and decomposing bodies laying on the mummification tables, the smell of spice and candle to cover the smell of death. I want to crawl into a sarcophagus and lay upon the quartz entombment whose smooth surface has eroded away from the acidic levels of decomposing material placed in it with its king or queen. Not out of fetish, just human curiosity. "Ok turn around now Shan.... SURPRISE!" Saqqara unlike the Great Pyramids we visited earlier in the day was slightly further from the city preventing a the large work-force of day-jobbing peasants to beg. There were of course a few, of a different variety though. Berber desert dwellers who live in nomad camps just out of sight of the pyramids commute in by camel or foot to earn tips telling made up stories about the burial chambers and the Step pyramid. 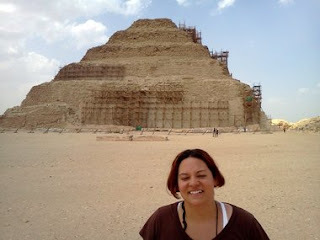 Luckily we had grown smarter by this point and managed to find some solace just outside of a current excavation of the Step pyramid. 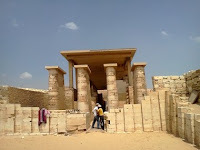 For the first time we joked and played around taking candid photos of one another and taking in the wonder of the ancient world. 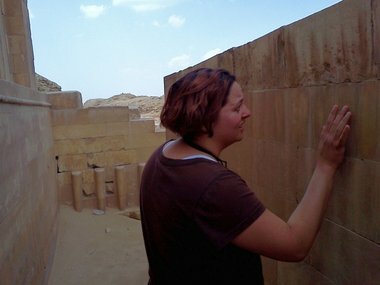 Shannon clearly can read Ancient Egyptian. 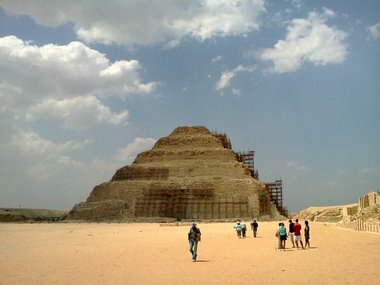 The thing to remind yourself as your roam Saqqara is that the next time you visit even less will be there. Once a complex of massive statures and pristine buildings, many monuments have been moved to museums both in Cairo and the western world. Some damaged in the process, and then there were the countless pirates, pillagers, and simple tourists who carve the walls, crack the rocks or thieve a bit of history over time. While it's still overwhelming what remains, it helps to arrive with a perspective and imagination of how amazing this place would have looked thousands of years ago. 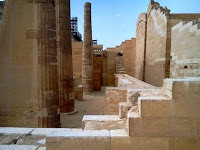 Saqqara is probably the closest you will come to that westernized feel of romanticized Egypt. 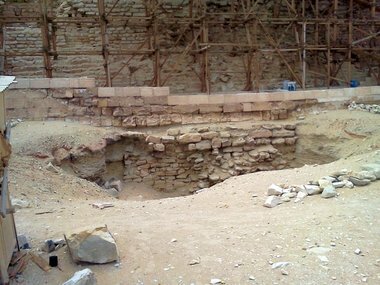 Private nooks to get lost in, treasures around the corners in the ruins and a bit of quietness as your contemplate why you never went to school to become an archaeologist. There's also a bit of Greek and Roman feel to some of the outer buildings which is common among the later dynasties. It's much more than history or monument- this is where myth, legend, and some of most amazing stories we have to tell today probably begun. It's like looking into space and seeing back in time, the pyramids and more importantly Saqqara allows you to peak back in time over decades, over thousands of years and see the evolution of man- of you, of me- of us.